Ramen is really one of the most amazing things ever created. 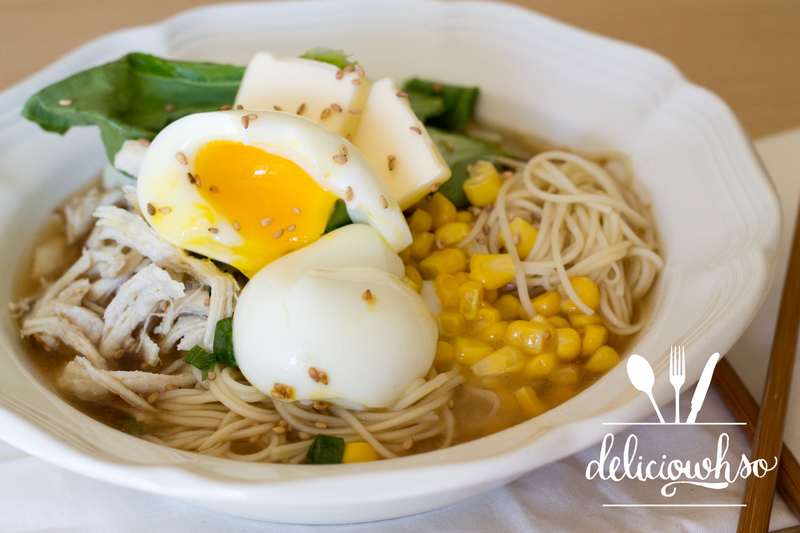 Yes, the instant stuff is good, but the homemade ramen is even more amazing. 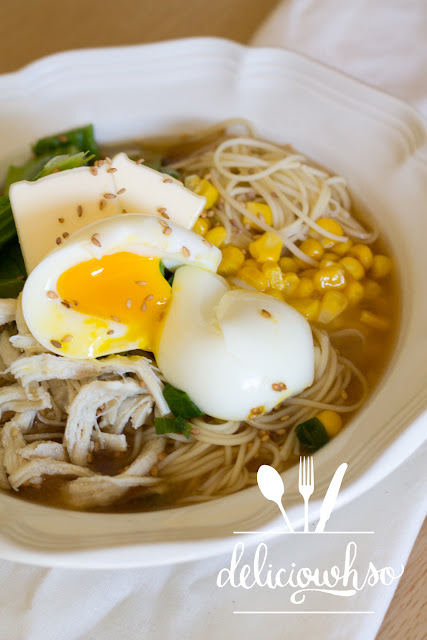 There's just something about homemade broth that makes it extra special. Some miso adds depth, while butter adds richness. 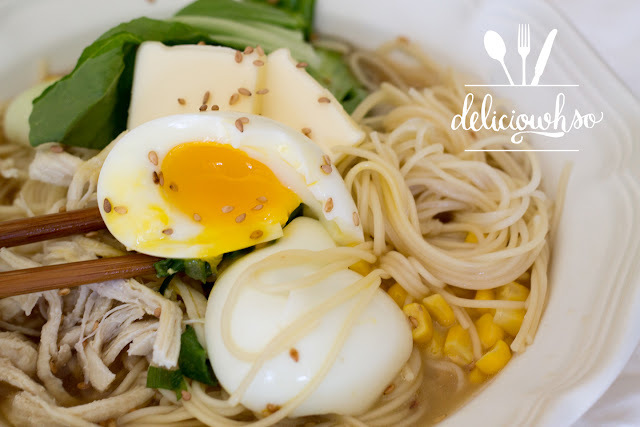 All this topped with a soft boiled egg makes for an amazing meal. Unfortunately, when I made this, I didn't have ramen noodles. 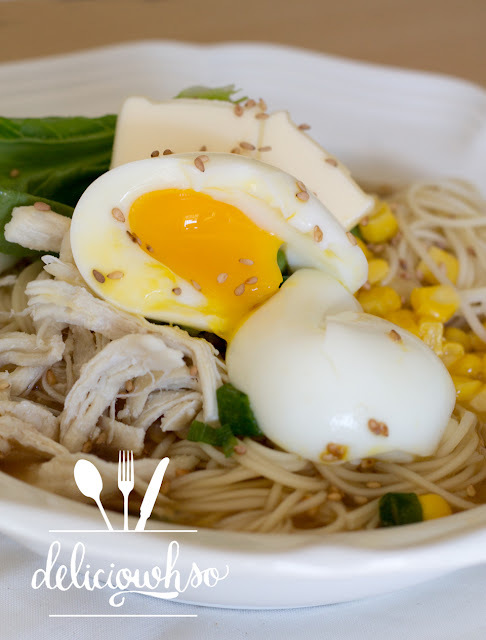 I prefer to use the frozen or refrigerated noodles for this. I couldn't find it, so I resorted to dry egg noodles. Unfortunately, I chose some that were on the thin side. It was still delicious, but some fresh ramen noodles would have been best. I recommend splurging on the good stuff, not the instant noodle. I am planning on making ramen noodles at some point, but haven't found the time yet. I'll let you all know whether or not it's worth the time. 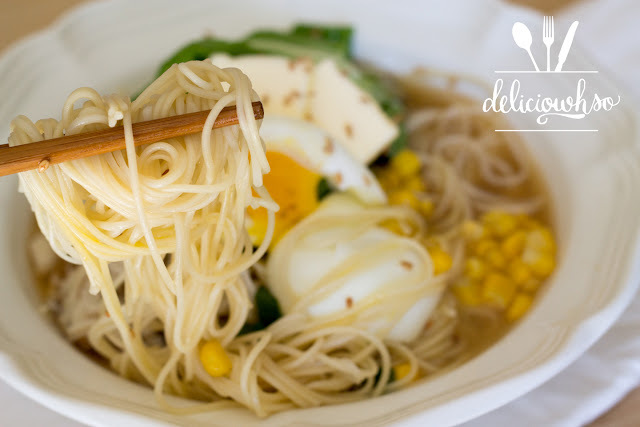 We all love instant ramen, but this recipe is something great. Even though it does take some serious time, it is another league or noodles. I highly recommend taking the time, at least once. I made this for myself when I was sick (I know, a bold move for being sick), and it was the most comforting thing I could have eaten. The best part was that I didn't have to leave home to eat it. 1. Boil chicken breast in a medium-large pot with water, salt, and garlic. Once it comes to a boil, let it simmer covered for 4 hours. Add water as needed to replace the evaporated water. 2. As the broth boils, use a small strainer or a spoon to strain out the foam that forms so that you can have a smooth, clear broth. 3. After the stock has cooked, remove the chicken and allow to cool. Do not get rid of the broth. Then, use your hands to shred the chicken. Lightly salt and set aside. 4. Add the soy sauce, mirin, sesame oil, and miso to the broth. Allow to boil and incorporate to a smooth soup. Keep hot. 5. In another pot, cook the ramen noodles until tender. Strain and cool slightly by rinsing the noodles. Separate into bowls. 6. Boil water in a pot. Once it boils, add the eggs into the pot gently. Allow to cook for 5 minutes. 7. While you wait for your eggs, rinse and chop up bok choy. In a small saute pan, cook until just slightly tender. 8. Once the eggs are cooked, cool them quickly in cold water. Peel the eggs and set aside. Be very gentle, the yolk will be soft and runny, so you want to make sure you don't break the egg. 9. Pour your hot broth over the noodles. Add your bok choy, chicken, a big spoonful of corn, and a slice of butter. Top the bowl with your egg. 10. Garnish with scallion and sesame seeds and serve immediately. This may not be a lazy day, quick recipe, but it's worth the work! The other great part of this recipe, is that it's affordable. I had most of this already in my house, and one chicken breast can feed the family. It's a simple grocery trip, with great results. I hope you can enjoy it as much as I did!